Figure 11.1. Transpeptidation reaction catalyzed by the ribosome. Figure 11.2. 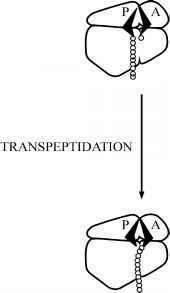 Schematic representation of transpeptidation reaction between aminoacyl-tRNA and peptidyl-tRNA on the ribosome. 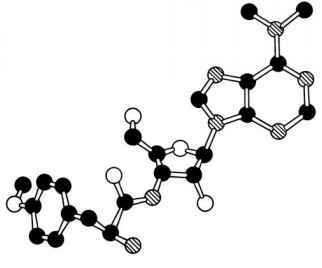 acceptor substrate. The latter requirement needs a special comments. 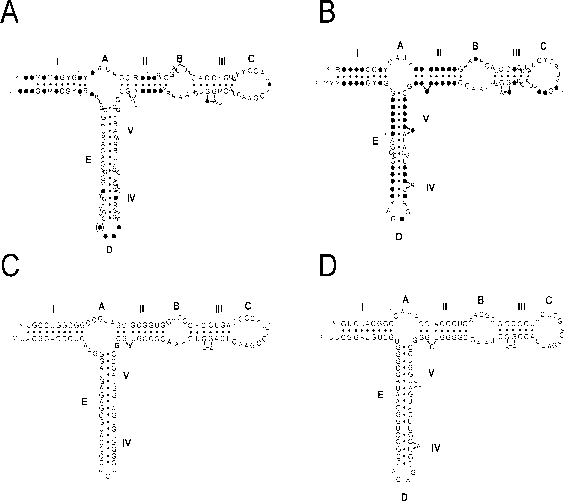 Depending on the specificities of different aminoacyl-tRNA synthetases, aminoacyl residues become originally attached either to 2' or 3' position of the ribose residue in the tRNA terminal adenosine (see Section 3.4 and Table 3.1). In solution, however, the aminoacyl residue migrates between the 2'- and 3'-positions. In PTC the aminoacyl residue is fixed only in the 3' position. The free 2'-hydroxyl of the acceptor substrate ribose is not essential for transpeptidation; if it is substituted (e.g., methylated) or is absent (2'-deoxyderivatives), the acceptor activity of the substrate is retained. The 2'-hydroxyl is, however, indispensable to the activity of the donor substrate. Figure 11.3. Ball-and-sticks skeletal model (without hydrogens) enzymatic center.